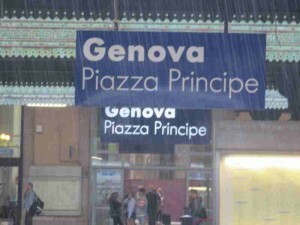 I got into Genoa, Italy from my overnight ferry trip. I was a little spacey. I definitely did not have one of my better nights sleeping. Then again, what do you really expect sleeping in a chair on a ferry? The next time I may rethink my decision not to have a bed in a cabin. But, whatever my mental state of mind I had to get on a train and make it to Nice, France where I had a reservation for the night. That, of course, is never as simple as merely saying it. First I had to find the train station. I did that. Then I had to get a ticket on a train. That wasn’t as easy as I thought. The fist train was sold out so I caught the second train. In the interim I had a couple of hours in Genoa. I’d been there before. While it’s a city with history, it’s hardly a tourist hot spot. Notice in the picture that there was quite a bit of rain coming down. Sometimes, it not only rains in Spain, it rains in Italy as well. This entry was posted in Travel and tagged Europe, Genoa, Italy, Train on May 31, 2014 by Steve.